Last week saw the release of matric results for 2013 in the Western Cape. Two schools in the Western Cape that used Paperight’s past matric exam papers as part of their teaching this year saw huge improvements in their pass rates and the quality of their passes. Pelican Park High School’s principal, Mr. Cader Tregonning, made it his mission to pull his school’s socks up. When he heard about Paperight matric exam past papers, he encouraged all students to buy them at the beginning of the school year. It was clear to see that those that had bought them were sailing ahead in marks and confidence by the middle of the year. Pelican Park High School ultimately achieved a pass rate of 93.5% (up from 80% in 2012), and had 5 subjects with a 100% pass rate: English, Afrikaans, History, Life Orientation, Mathematical Literacy. Silverstream Secondary School had the unfortunate distinction of being the school in the Western Cape with the lowest pass rate in 2012. Minuteman Press Cape Town stepped in to help them out by donating Paperight materials to their students. 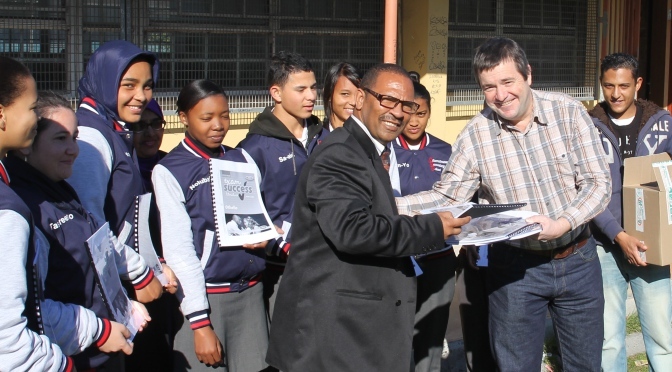 Despite enormous adversity – including gangsterism in the surrounding areas – the staff and students worked hard in 2013 and their hard work shows in their final results. Silverstream Secondary School achieved a pass rate of 69.1% (up from 34.2% in 2012). That means that their pass rate almost doubled. Even better, the number of students who achieved Diploma passes went from 9.2% to 38.2%, meaning that more matriculants from the school can look forward to tertiary education. So there we have it! Proof that Paperight materials are essential in the classroom. At such affordable rates, we can make sure that more classrooms are better equipped to ensure that their students have the best possible chance of success. Why not head down to your local high school/s and introduce yourself with a copy of Paperight’s catalogue? You’ll find a copy here for download. If you would like to get involved by sponsoring a school by supplying them with much-needed educational supplements, or would just like to find out more about our programme and what it takes, please contact us at team@paperight.com or 021 671 1278. Previous Previous post: New additions to our poster archive!